Generate Icons and splash screens for all devices with a single command: ionic resources which Saves at least a day of image preparing in various sizes. Instantly reflect code changes, even when you are running directly on your device or emulator. Easily access the full native functionality of the device using ng-Cordova. Also, Ionic now supports a full stack Backend services and tools for Deployment, Analytics, Push notifications, etc. Ionic has a command line interface which uses Cordova in the Backend and allows you to build apps for iOS and Android. Familiarity with Angular as a front end framework is extremely helpful in building Ionic applications. Ionic framework also comes with the Ionic creator, a great tool that helps in quick user interface prototyping. 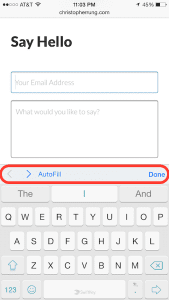 To create an interface using Ionic creator, you need to sign-up on their website and choose your application name. Creating an interface using this tool is similar to working on any prototyping tool, e.g. Balsamiq. Here you can create elements, add aesthetics to them. It can later be exported as a template to build an actual application. To go from the template to mockups, Ionic offers three options: Ionic CLI, Zip file, and Raw HTML. You can choose whatever feels best for your needs. Xamarin is a cross-platform development framework, which allows you to build iOS, Android and Mac apps using C#. Xamarin aims directly at the.NET developers. It uses C# language and.NET framework. 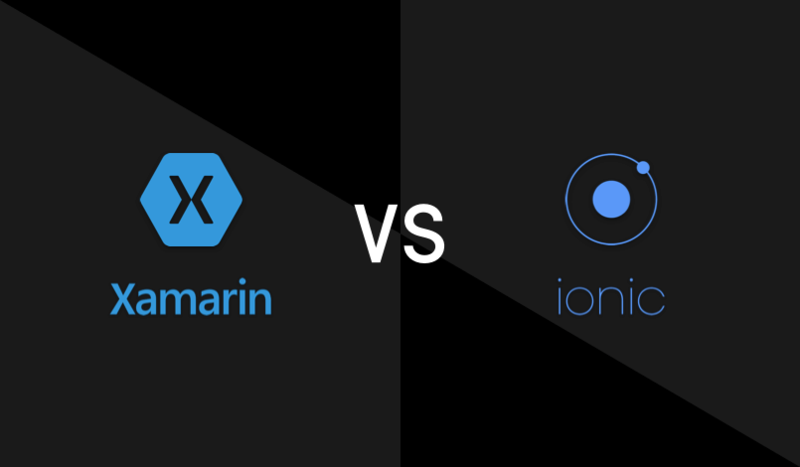 Performance could be a major issue when it comes to Non-Native applications, but Xamarin has the ability to leverage hardware acceleration to boost the performance unlike other Hybrid platforms including Ionic. Last year, we ran experiments to measure the computing performance of Native vs cross-platforms applications and the results were staggering. Anyways, so Xamarin is pretty much intended for .NET people, if that’s what you have, it makes sense to go forward with Xamarin. Xamarin apps have a full range of API access to add different functionality to your app. Xamarin apps are built with native interface controls, so their look and feel is very close to Native. Xamarin development ecosystem which mainly provides a set of runtime engines, Native APIs access, Native user-interface and Native code base to develop Native and cross-platform applications. Xamarin test cloud: It provides an online testing cloud that automates your app testing on thousands of real devices in the cloud. Xamarin has embedded around 2000 real devices in the cloud to ease the testing process. Xamarin Insights – Xamarin recently joined with Hockey app to bring you the monitoring service that tracks crashes and exceptions, and helps developers know in real time what’s happening with real users. 1. Xamarin.Android– A development environment to build Xamarin apps with Android. Unlike the Native development, here you work in C# instead of Java. You can define your UI in activities, similar to the Native development. Xamarin provides runtime and binding together, to make it all work. 2. Xamarin.iOS– It uses #C instead of Objective-C or Swift to develop the app. The runtime environment is similar to Native iOS development, so developers need to code in #C and Xamarin takes care of the build by using Objective-C wrappers to make the codes compatible with Ios platform. 3. Xamarin.Forms– With Xamarin forms, you can build true cross-platforms which work with all the platforms .i.e. Android, iOS, and Windows. The codes and business UI can be shared across all the platforms, in an otherwise, you had to create separate UI layers and code base for each platform. 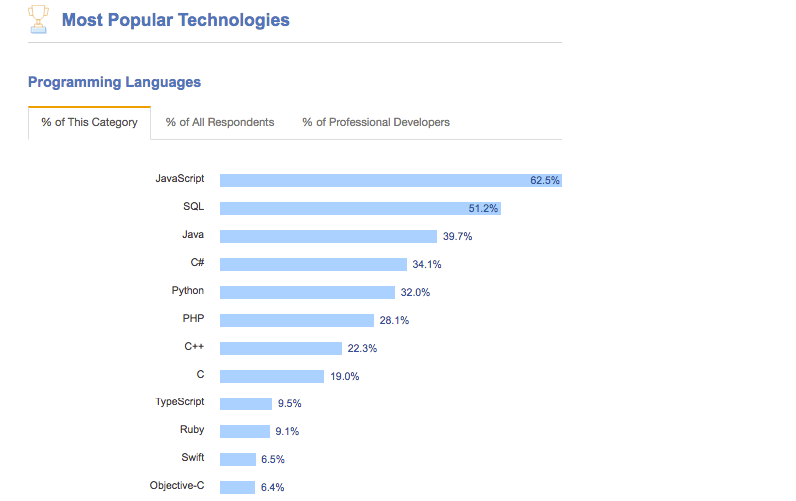 Angular.Js and Cordova developers are available in abundance when you compare it with the total number of Xamarin developers. A simple search on Github shows 13k repositories for Xamarin, and staggering 30k repositories for Ionic. It’s matter of the fact that Xamarin claims that they passed 1 million unique developers mark in 2015, but it doesn’t reflects well on Github. UI implementations in Ionic are a bit challenging, and often very non-standardized. Last year Apple started rejecting apps that were using UIWebBrowserView. Now, many thought this was a completely random step in doing so, but Apple suggests public UIWebView to developers. Think of UIWebView as something that’s meant to support websites, not apps. So, basically, they end up accessing internal hierarchy of UIWebView when they use UIWebBrowserView, which also means that Ionic is often digging into private implementation details in order to whatever they want. This takes the minor cross platform offense to something that’s a bit hacker life, not app store safe. But, if it’s very simple to avoid, then people could have done it? Designers, who love the prototyping tools and the extra control over the design process of the application, prefer Ionic creator. Ionic creator is also more collaborative in onboarding everyone who is associated with the project- from stakeholders to designers and developers. You can create wireframes or add custom themes without requiring any understanding of the underlying code. Ionic 2 also has them-ing, which means that your apps won’t look the same as all other applications. Changing defaults is easy on Ionic, often the best apps on Ionic are fully customized. As far as theme-ing goes, Ionic has three different modes to apply following different themes on your platforms: iOS style theme, Windows Phone style themes, and Material design style theme. For anything that doesn’t falls into iOS, Android and Windows phone, the default selection of theme would be “material design”. 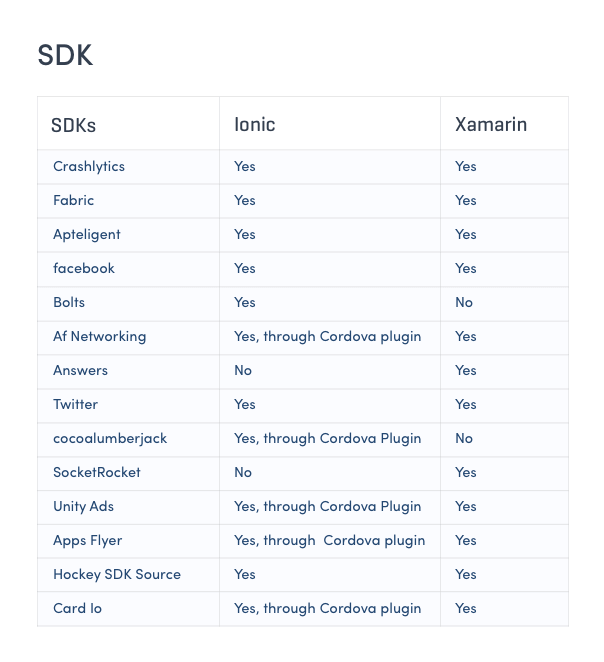 On the other hand- For UI Implementations in Xamarin, one has to know the platform specific SDKs, components, usage and architectural concepts. For someone works with .NET will face a little difficulty but any C# developer can easily build a shared library and implement the business logic with UI. 1. Delay the splash screen launch with a plugin. The plugin dismiss the launch screen after the app has fully initialized. 2. Using Navigation controllers to handle the custom animations. 3. Use a livereload tool to create a default back state, even after the saved-in memory history is lost. The purpose here is to reduce the booting time, which becomes a hindrance in development process as well as, when users use the app. In Ionic 1 if you setup simple image sliders, the sliders initially aren’t responsive, until the pane containing application is manually nudged. But, In Xamarin( Xamarin native and Xamarin.Forms) it is easy to create responsive designs. Secondly, Implementing animations and transitions in Ionic is not as smooth as it should be, Xamarin on the other hand offers smooth much better working animations and transitions. Moreover they also support custom animations. Speaking of Animations, Ionic won’t be an ideal choice for building games or Graphically complex applications. There aren’t much tools available to support high intensive graphics or highly interactive transitions. But, by Using material design components, you can build custom or strange animations in Xamarin applications. Although Ionic reports 4.1+ supported, but there has been some cases of a broken experiences for 4.2 and other versions below 4.4. Ionic 2 specifically supports Android 4.4 and up, no support for any versions below that. There are couple of iOS 9 compatibility issues: Apps developed for iOS 8 or earlier show some issues as they sometimes don’t launch properly on 32-bit devices. Also, developers often face P/invoke path failed. These two are the most faced issues with developers, however, they can be dealt with re-building the app with stable release of the application. Xamarin has no support to build progressive web apps. Xamarin applications can be build for Night Mode feature, but as of now Ionic doesn’t provide any similar support. Although, some may confuse it with the app going into sleep mode, while in background. So, just for information, there is Cordava plugin which can be integrated with Ionic to enable the sleep mode feature. For Xamarin, sleep mode is officially embedded in their platform. Xamarin has a good network of technical and consulting partners for the businesses who are inclined towards building Hybrid or Native applications. As of now, Ionic has a very limited set of development partners which is around 50, where Xamarin has around 250 partners worldwide. Xamarin has a better mobile device management suite for enterprises than Ionic. Xamarin apps can be easily integrated with Microsoft Intune services for organizations dealing with BYOD devices. For Ionic, Microsoft had launched a Cordova plugin, which can be use with Ionic apps to manage enterprise devices remotely. For the developers, who are more serious about the performance of the applications, use a custom and single API to compose advance queries and modeling complex data. Realm is one such tool to do so. Ionic has no official support by Realm, but they have built a Realm database with an API support, which can be used by Xamarin apps. Firebase has a really nice support for Ionic apps, but for Xamarin there are a couple of wrappers available in Objective-C but no real support. Apart from Firebase, there are some MBaaS vendors like Microsoft Azure, IBM Bluemix and Kinvey, who provides support for Xamarin platform to build highly available and scalable apps in cloud. Xamarin can be leveraged to use the existing .NET libraries to interact with the web and other data services while sharing the C# code and business logic across both client and server. But, Ionic can only be integrated with existing back-end technologies like Node.Js, Express.Js or Ruby on Rails . If there are any subtle difference in the overall architecture, things can get messy as there won’t be any shared code-base. Nonetheless, familiarity with Angular.Js would drastically impact the rapid development and integration. Angular supports all the possible architecture .i.e. MVC, MVVM, MVW etc, so you can expect a smoother integration but be prepared to spend huge time. Both Xamarin and Ionic are easily integrable with SAP, with Xamarin being more compatible due to their hybrid approach with C# and.NET framework. On the limitations part, Xamarin.iOS doesn’t complies ahead of time, so the developers don’t have the same level of control over the code that executes on iOS. Also, when you use Xamarin, you lose the ability to share the code with your HTML5 app team.On the limitations part, Xamarin.iOS doesn’t comply ahead of time, so the developers don’t have the same level of control over the code that executes on iOS. Ionic on the other hand is extremely compatible with code sharing with other HTML5 platforms. For someone who utilized.NET APIs to increase the functionality, the chances are that not everything is available for the Xamarin.IOS. Xamarin based mobile applications are extremely large when it comes to app size. For enterprise dedicated mobile devices, it may be extremely easy to incorporate these applications, but when it comes to BYOD, especially with users having limited space on their mobile, a large sized app may create performance issues. Compress the images using tinypng or something similar. Reduce the server side dependencies like Database and server request etc. Minimize the CSS file along with updating the index file. Xamarin can be integrated with Azure IoT easily, as Xamarin uses Microsoft’s IoT and Cloud capabilities. On the other hand, there is no Integration of nRF’s hardware development kit with Ionic. But, Ionic apps can be integrated with wireless sensors, ibeacons or bluetooth devices for simple use-cases. Femto CTO, Alex Albino used Ionic along with Cordova plugins to create an interface for hardwares over Bluetooth smart. You can check their codes on Github. While we agree that these are tiny glimpse, but there are endless possibilities on what could be built on Ionic’s speed to market capabilities. Xamarin has nice guidelines on how to improve performance and decrease battery consumption by a mobile application. Ionic on the other hand makes it very difficult for us to optimize battery consumption. Manufacturing- FDA, EPA and SEC etc. Xamarin applications can be build to imply these regulations despite the industry and their policies. Furthermore, Microsoft’s cloud data-centers are available in 36 regions worldwide, which is assuring for enterprises, who are dealing with these compliances globally. We can not say the same for Ionic, but it definitely depends on the skills of the developers, you’re working with. Xamarin Studio and Xamarin’s Visual Studio extensions include advanced debugging tools that work across the full spectrum of supported platforms and environments. Developers can perform interactive debugging on an app that is running in the Android emulator, the iOS simulator, or even directly on hardware. In contrast to manual testing and simulator-only testing, Xamarin Test Cloud lets teams test every feature on more than a thousand devices and on every commit. Catching bugs before released shortens development cycles and allows more time for innovation. Integrate Xamarin with Hockey app to leverage in house app store for beta testers. Crash reports are also available for Android, iOS, Mac and Windows apps. Report provides meaningful stack traces with friendly class names, methods, and accurate line numbers. Xamarin’s UITest and Calabash frameworks enable powerful automated UI testing. Developers write tests that behaves as users do, performing taps, swipes, rotations, and waiting for UI elements to appear. These test results are available within minutes, and they include everything from feature testing to comprehensive regression tests for complete coverage and a fault free application deployment. Scripts written are flexible to any UI change that may happen in design and development, as opposed to other available OCR solutions that frequently break when UI changes are introduced. These scripts/tests are written in C# in Xamarin Studio or VS, , or in Ruby using Calabash, the industry’s most powerful framework for automated testing of native and hybrid apps. Ionic is missing code quality options and various workflows that are needed by enterprises when building an app in a CI/CD environment. For Deploying the apps to the app store, Ionic supports tools like Fastlane. Ionic doesn’t offer any cloud testing offerings, you can test your app in simulators, mobile browsers or by using Apple’s testing services through Apple developer account. Xamarin have built-in Insight tool for easy analytics and crash reporting solution that enables fast discovery, troubleshooting, and resolution of issues for live users. It’s a proactive method for monitoring and maintaining apps that significantly increases user satisfaction since problems can be resolved before they impact users.. Although, Ionic doesn’t have any analytics dashboard, but you can still integrate your app with third party MBaaS tools like Firebase for real-time analytics and reporting. 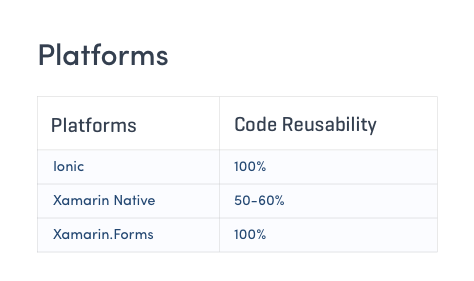 Ionic and the updated Ionic 2.0 is a rapidly growing Framework which does offer many features and but has some drawbacks since it’s not matured enough for enterprises. Where, Xamarin offers everything from Development platform, test cloud, app Insights to an eminent Microsoft Integration for a truly scalable application for your business.